To properly describe the difference between GERD and EER we'd like to explain what GER is. Gastroesophageal reflux (GER) is movement of gastric contents into the esophagus that results primarily from transient relaxation of a valve-like structure at the entrance to the stomach called the lower esophageal sphincter. 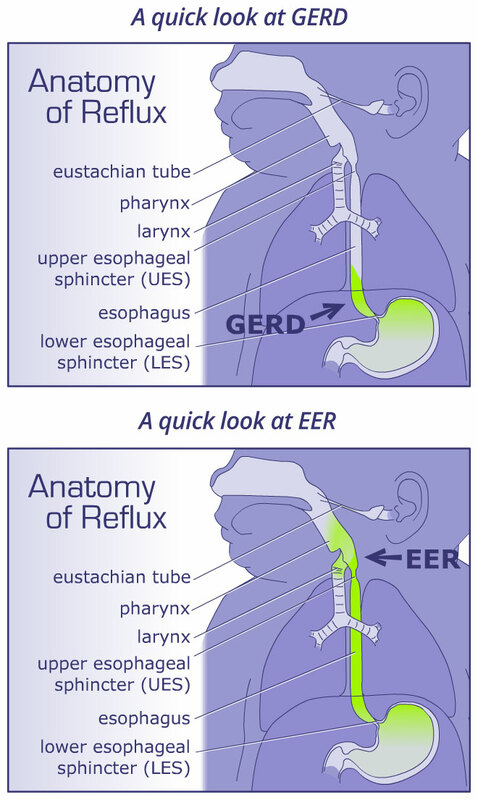 Use the interactive image below to display different functions and how EER and GERD differ. Click on each section of the digestive system shown and each section of text. Adults may sometimes experience GER as "heartburn" because hydrochloric acid in gastric fluid irritates nerve endings in the esophagus. When GER is frequent or severe enough to result in symptoms or tissue damage, the diagnosis is gastroesophageal reflux disease (GERD). Adults are considered to have GERD if heartburn is frequent (more than 2 times a week), severe, or prolonged. If pain is not accompanied by any damage to the esophagus, the condition is termed is non-erosive reflux disease or NERD. If the reflux also causes inflammation and ulceration of the esophagus, the diagnosis is erosive esophagitis. Untreated, GERD can lead to a pre-cancerous condition known as Barrett's esophagus. This is a great page that outlines the differences between Reflux, GER, GERD and NERD. Transient relaxation of the lower esophageal sphincter occurs periodically throughout the day, reflux can be considered a normal physiological process in people of all ages. But babies tend to have more reflux events than adults due to the immaturity of their lower esophageal sphincter function. This results in periodic episodes of "spitting up." For most babies, these spit up or vomiting episodes don't cause any problems, and they typically outgrow their symptoms in their first year as their sphincter function matures. By contrast, babies with GERD may vomit excessively, cry inconsolably or be chronically irritable. So when there is long term issues and pain involved with the spit up and reflux, that's when it's considered reflux disease as shown in the page link to infant GERD symptoms above and here. Both GERD and EER can be effectively treated by controlling the damage and symptoms of infant acid reflux by using a PPI dosing regimen specific to your baby's age and weight. This dosing regimen is called MarciKids dosing. Most Moms and Dads with infants suffering from acid reflux have heard about MarciKids. For medical literature that supports MarciKids and what we do here at Infant Acid Reflux Solutions please visit the Medical Articles page . That is the conclusion of a brief description of the difference between GERD and EER. Please contact us for any questions. Some of the contents of this page originate from the Maci-Kids website and from Jeffrey Phillips' Pharm. D. and his research in treating infants with acid reflux while at the University of Missouri.